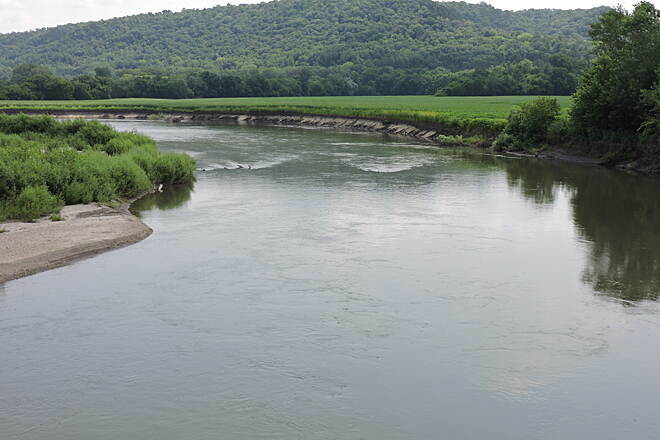 Along much of its route, the Root River State Trail follows the winding course of its namesake river for 42 miles through the Minnesota towns of Fountain, Lanesboro, Whalan, Peterson, Rushford, and Houston. The paved trail is mostly level, although a section just west of Houston (around Money Creek Woods) has some steep hills for about 0.5 mile. 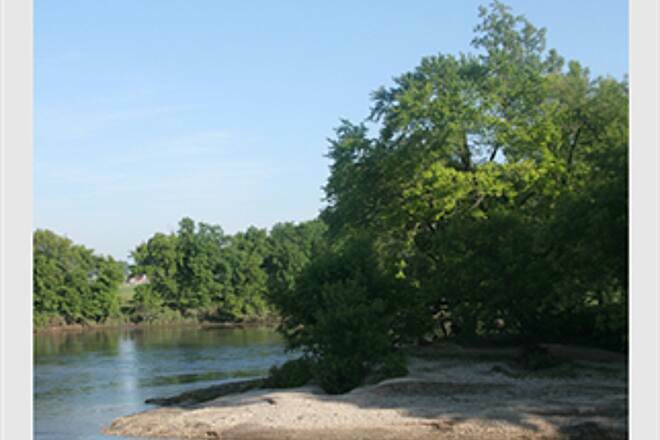 Along the way, you’ll have outstanding views of the tall limestone bluffs and the steep hills thickly wooded in maples and birch that rise above the river. Watch for wildlife, such as turkeys, deer, raccoons, and birds of prey. You might also encounter rattlesnakes sunning themselves on rock outcrops or along the river bottom and trail. Rattlesnakes are a protected state species and should be left alone. The towns along the route provide many amenities, including bed-and-breakfasts, campgrounds, restaurants, museums, outfitters, and interesting shops and historical buildings. 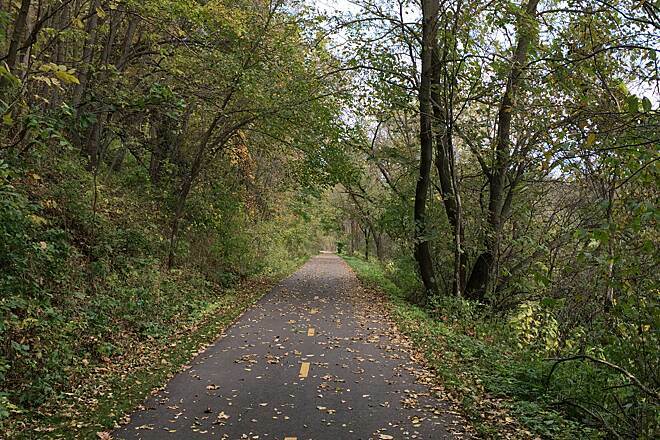 The trail is built on an old railroad right-of-way that followed the river, linking rural communities throughout this alluring tourism region of southeastern Minnesota. Cross-country skiing is popular during winter, and the trail intersects with a system of groomed snowmobile trails. 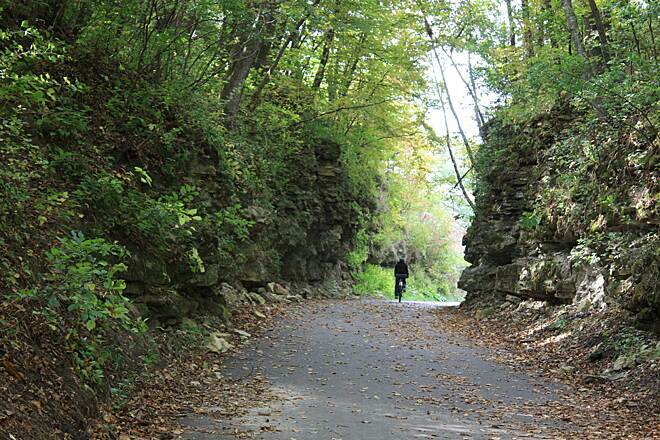 Between Lanesboro and Fountain, the trail meets up with the 18-mile-long Harmony–Preston Valley State Trail. 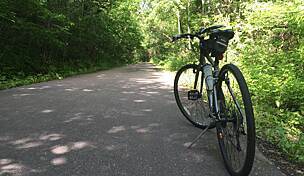 There is an access point on the Root River State Trail at Isinours Management Unit, with parking available about 0.5 mile west of the northern trailhead for the Harmony–-Preston Valley State Trail, just beyond County Road 17. 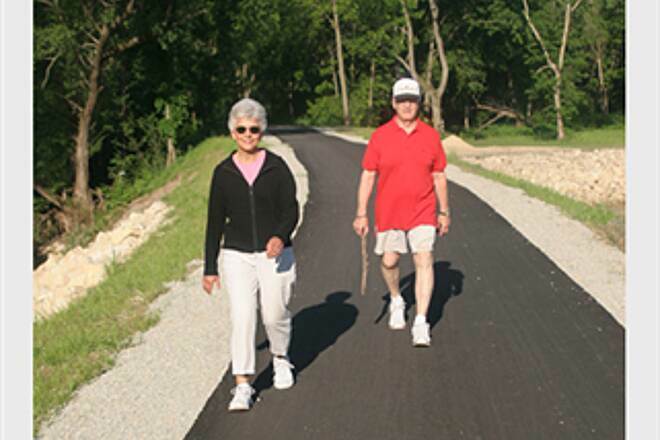 The combined Root River/Harmony–Preston Valley network provides more than 60 miles of paved trails through Minnesota’s most scenic bluff country. Every trailhead in the towns along the route has a bicycle tune-up station. Restrooms are at every official trailhead along the route, except in Whalan. To reach parking in Fountain, take I-90 to Exit 218. Turn left (south) onto US 52, and go 21.3 miles. 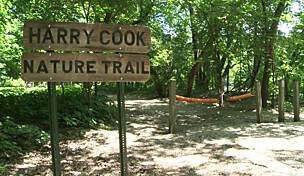 Turn left onto County Road 8, and in 0.3 mile reach the parking lot near the city park/softball field on the right. In Lanesboro parking is available on the street and at the lot by the Lanesboro Community Center and Sylvan Park. Take I-90 to Exit 218. Turn left (south) onto US 52, and go 21.3 miles. Turn left onto CR 8, and in 9.1 miles turn right onto Parkway Ave. S. In 0.2 mile Sylvan Park is on the left. Trail access is 0.2 mile north at CR 8/Elmwood St. Parking is available near the midpoint in Peterson. Take I-90 to Exit 242. Head south on CR 29, and go 1.6 miles. Turn left to stay on CR 29, and go 5.6 miles. Continue straight on CR 25, which becomes S. Church St., and go 5.8 miles. Turn right onto Park St., and immediately turn right onto Fillmore St. to reach the city park. The bike station is located on the trail at the intersection of Park St. and S. Church St./CR 25. For the eastern trailhead, take I-90 to Exit 258. Head south on MN 76, and go 13.5 miles. Turn right onto W. Plum St. Parking will be on the right. Went from Rushford to Whalen and the trail was in great shape. It was the first time I was on a trail in Minnesota. Great first impression. Will try other half after Whalen and the harmony trail next. We live in the Preston area and moved here due to my husband's love of flyfishing. The Root River trail runs along the Root, but also along Camp Creek by Preston. It's lovely to walk or bike these trails, but those of you who like to fish can find some fairly good access to the streams as well! 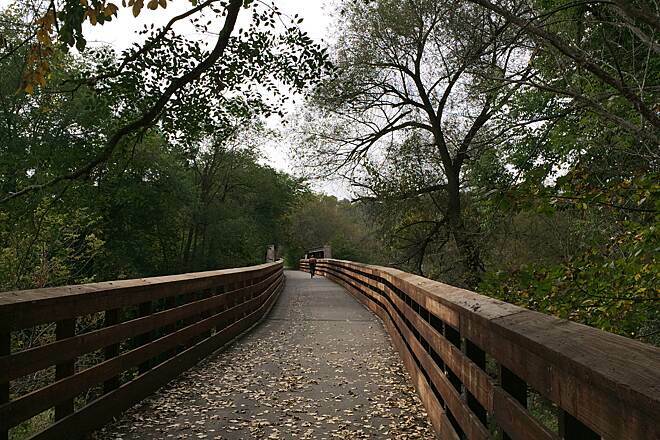 Scheduled closure until 9/2/16to repair/resurface.much needed repairs will make this trail awesome! Rode this trail 7/16. Beautifully smooth and scenic from Preston to Peterson. Rough trail to Rushford. Had a great burger at Shawnee's in Rushford. Nice bike stop in Lanesboro with bathrooms, water,air-this area is busier during the weekend so expect a bit more company in this area. There are several legs in this trail, all well marked. Just an exceptional trail. A buddy and I rode this trail last weekend round trip starting out at Houston with the turnaround at Fountain. I was impressed with the overall quality of the surface, signage along the way and the scenery. This area of Minnesota is surprising hilly and the last 7 miles into Fountain was a tough climb (guessing a 600ft climb) with about 35 miles already peddled. After some food and beverage at the bent wrench bar/restuarant in Fountain we turned around and heading back down the to Lanesboro. I was surpised at the how steep the climb up to Fountian really was. this trail is an absolute gem with its varied topography and near pristine trail condition. It was well worth the drive from chicago. Highly recommend this trail. One of the most enjoyable trails I've ridden. Made a special trip just to ride this trail after research and reading reviews. We were not disappointed in the least. We dropped a vehicle in Whalan and rode from Fountain east approximately 16.5 easy miles. This was the best part of our plan as the first 5 miles were downhill! We literally had to lightly pedal only twice over that span. The scenery couldn't be more beautiful. 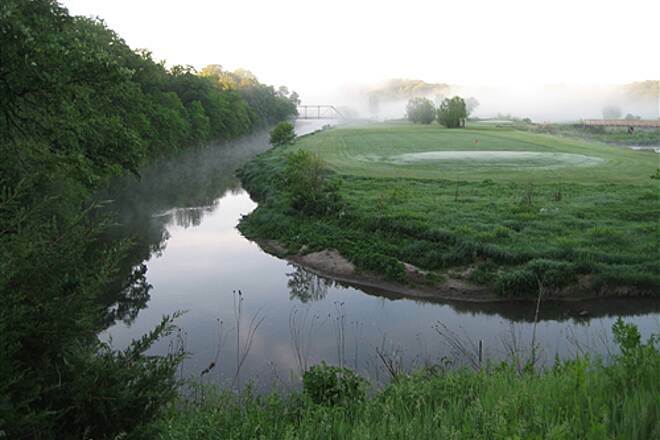 Rolling farmland, forest, and bluffs add to the frequent river views. 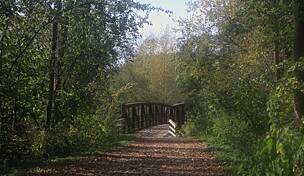 The trail is extremely well maintained with picnic benches every mile and log shelters. The bicycle epicenter was in the quaint, lovely town of Lanesboro. Plenty of shops, cafes, and bars to satisfy every taste. Strangely though, this town seems to have a "fly issue". The stockyards are just two blocks from the center of town, so there seems to be an overabundance of flies in every place we stopped. I wonder if it was the time of year, or a constant irritation. Regardless, we thoroughly enjoyed this trip and plan to return next year. Attention Road Bikers...Highway 16 from La Crescent west offers little traffic, wide shoulders, smooth pavement, and lovely rolling terrain! 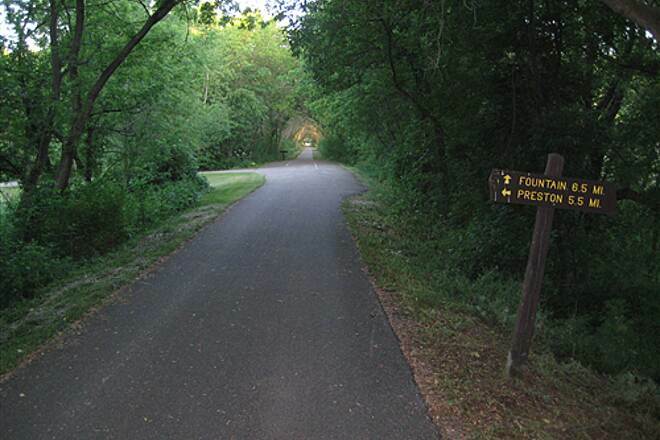 We rode this trail from Houston to Fountain including the spur that goes from Lanesboro to Pearson. The trail was incredible as it follows the Root River for a majority. 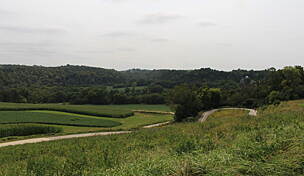 The scenic bluffs, rock cuts, Farming country and corn fields along the river were the driving force for us to complete our century ride that day. The trail passes through many towns that offer food, beverages and historic old buildings. All though the trail is scenic through out we were partial to the portion between Houston and Rushford. The bridges were long over the Root River and offered great views of the bluffs from the bridges. The trail does have a couple of challenges though. The trail is 100% paved asphalt and is in good condition between Houston and Petersen and great condition from Petersen to Fountain. The trail does seem to go uphill going west from Houston to Fountain. Even though railroad grade with a west headwind it took additional time. There is a challenging hill about 4 miles west of Houston going west and a even more challenging hill just east of Fountain. That was a steep five mile incline. All though manageable it was a accomplishment for us to climb that beast. We had a quick lunch and a couple of beers at a bar and grill in fountain. Then it was the return trip to round us out at 101.18 miles for the day. This trail was a gem and is highly recommended. Well worth the drive "from anywhere" Enjoyable trail! Rode this trail with a couple of friends from Missouri late Sept 2014. We rode round trip from Houston to Peterson on the first day and liked it so much we came back and rode from Lanesboro the second day. Trail is in great shape with the exception of one section, which is a little rough, but it will be fixed I'm sure. Trail is very well maintained. New surface going East out of Lanesboro. Very nice. Fall colors were in full swing. Beautiful!! Folks just the drive out to Lanesboro is worth it. The road winds its way along on side of the river next to the bluffs, which were in full fall color, and the trail winds its way through the trees on the opposite side of the river. Beautiful! We even saw a Bald Eagle right in the middle of the road! I highly recommend this trail! Note on places to stay: There are a number of B&B's in Lanesboro and around Whalen that I know of. I would think other towns along the trail as well. We stayed in Sparta WI about 60-90 min away. See my post on the Elroy - Sparta trail. I spent 3 days / 2 nights riding every foot of the trail and visiting the towns it touches. 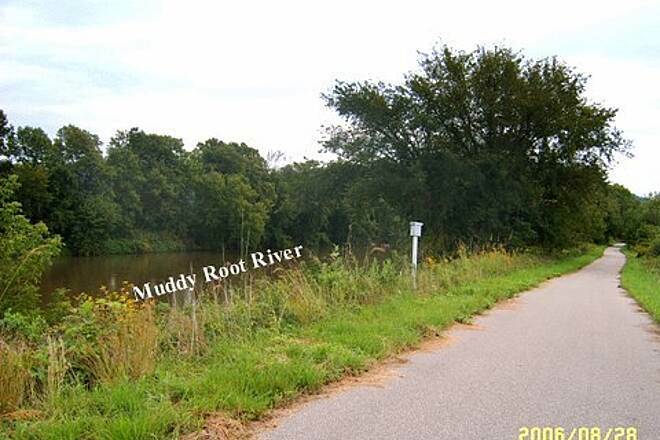 The trail follows a lot of river, it meanders, it has shade, portions of it that don't follow river meander thru fields with great views, the towns along the trail all embrace the trail with nice conveniences... I don't know what else to say. I had a great time. Very impressed. It is a good work out I usually ride from Houston to Peterson. 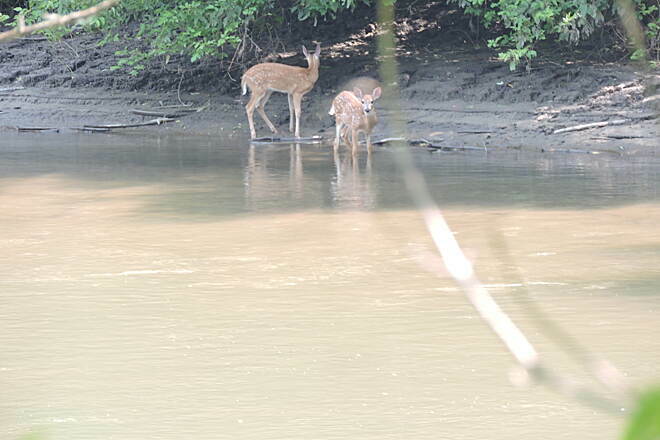 Many times I have seen deer, always lots of birds and the occasional snake. This part of the trail is not so busy as the Whalen and Lanesboro area which is nice and peaceful, makes it a pleasant experience. Bring plenty of water as it is nearly 13 miles to Rushford and hilly about 3 miles out of Houston. The visitor's center is always clean with showers :) with a very interesting nature center. Of all the trails in this area this is my favorite! My wife and I have only been riding about three years. We are older, and usually ride about 20 miles at a time for exercise and recreation. We rode both the Root River and the Harmony/Preston Valley Trails in their entirety on three days during the last week of September, and we loved it. 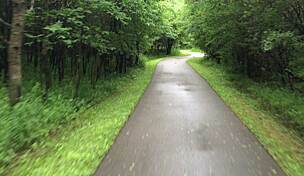 The trails are well maintained and traverse a scenic rural area. Most of the people we encountered were about our age, (it was not a time to meet folks with kids in school,) and were friendly and willing to engage in conversation. We stayed in Lanesboro, and rode up to Fountain and back on day #1 (22.5 miles). 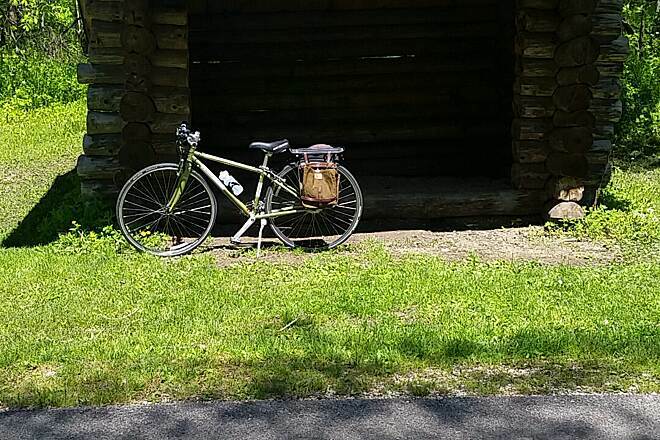 What I haven't seen publicized anywhere, and what made it possible for us to ride the entire trail, was the opportunity to hire the shuttle service from the Little River General Store in Lanesboro, (it's a bike and canoe shop). On day #2 they took us to Harmony, (to coast down those steep hills at the first part of the trail) and we rode back to Lanesboro, another 22.5 miles. On day #3 we rode the scenic 32 miles to the trail's terminus in Houston, where the Little River owner was waiting to give us a ride back to our B&B. This was the first time we planned a trip around bicycling. It was the first time we even took our bikes with us on a trip. After the positive experience we had with the Root River and Harmony/Preston Valley Trails, I think it is going to become a routine for us. We are already talking about where to ride next. I would recommend these trails and their scenery to everyone. I wish they were closer than the 450 miles we drove from the St. Louis area, so we could enjoy them more often. My husband and I have been going to this area at least once every summer since 1998. We usually camp at the Old Barn Resort outside of Preston with our three boys these days. From the campground it's a short trip into Lanesboro and beyond. Nice easy trail to ride with children, although on weekends later in the day it can be quite busy on stretches. We like to leave early in the morning and have breakfast in Lanesboro when we visit. For a more challenging ride you can head towards Preston and on to Harmony. Both are beautiful rides and we always enjoy our time in the towns. Plenty of restaurants, B&B's and campgrounds to fit a variety of tastes, especially for the small towns around the trail. A good summer outing. Rode from Lanesboro to Rushford weekend of Oct. 16, 2010. Some of the trees were past peek but it was still beautiful. Trail was in great condition. Pretty flat. Trees most of the way. Plenty of amenities along the route. Most of the campgrounds around the area are pretty nice. We stayed at Eagle Cliff it was really pretty settled between two cliffs next to the river. No problem getting to the trail from there. In Lanesboro the only real good eats were at Root on the River. Also ate at Chat and Chew, Peddle Pushers and it wasn't anything to get excited about. The Aroma Pie Shop in Whalen is excellent and a great reward for a long ride. When you get to Rushford I would suggest riding west into town to eat. Once you cross the bridge to the south is the Feed Mill Cafe, a great historic building that was recently renovated into a sandwich shop. Serves soup and sandwiches and desserts. If you have ATT phone service you will get NO signal in this area. 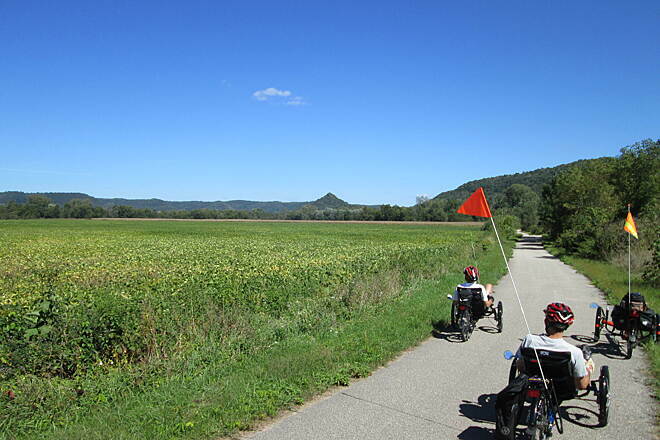 Rode this trail two days ago from Rushford to Lanesboro. That was the longest stretch that was rideable due to heavy rains that cause many washouts. The Mississippi was about one foot over flood stage at nearby LaCrosse. One part of the trail was waist deep under water. The trail surface was pretty good but a couple of sinkholes under the trail have left small but growing holes. They need to address those holes and the others not quite through to the surface yet. At one point the trail was washed out for about 50 feet in three inches of deep mud. I got lucky and was able to stay on my bike only because someone drove through it with a car or pickup clearing a tire path for me to stay in. If you ride this trail be sure to go to Aroma Pies in Whalen. Their pie is homemade and wonderful. It is right on the trail. The folks in charge of this trail did get warnings online right away about the washouts so I knew about them but decided to ride since I was in the area. The damage is not severe so it should be easy to clean at least what I saw of it. But they better get at all those sinkholes. The white paint marking them was helpful but not a fix. 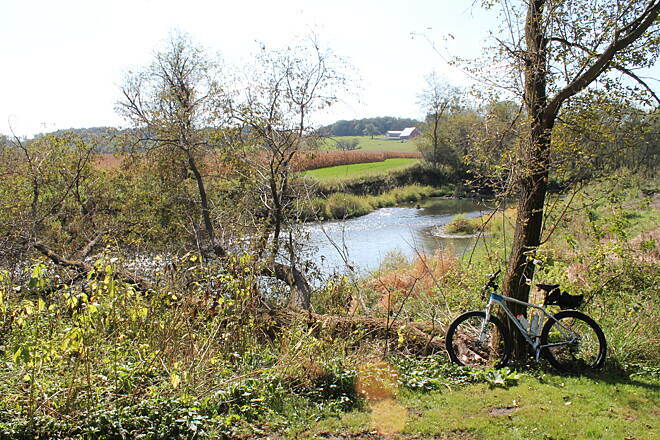 This past summer we spent a couple of days in Lanesboro and biked both directions from Lanesboro. This trail is one of the most scenic I have visited. 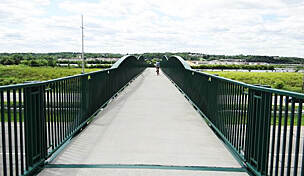 The communities along the trail have several businesses that cater to cyclists and other trail users. Lots of good places to eat and rest along the way. Several bed and breakfasts in and around Lanesboro make it a great place to stay. 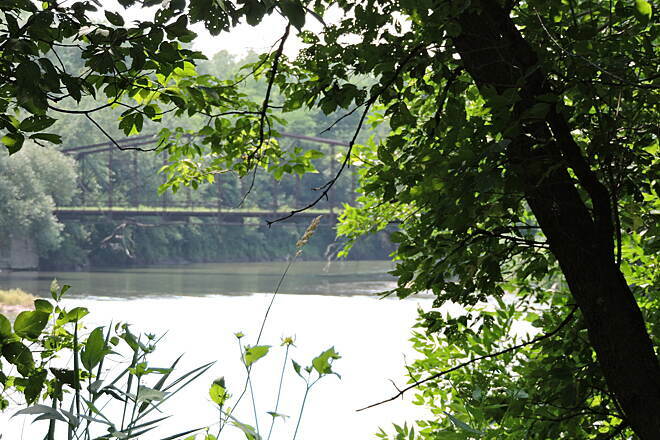 The Root River is also great for kayaking, with rentals right in Lanesboro. 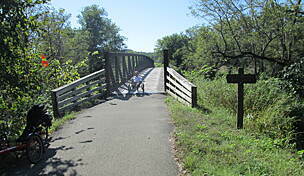 I have family that lives near Lanesboro and I look forward to riding the Root River Trail when we visit. The trail is very flat, has some remnants of the old days. Going south to Fountain, there are some challenging climbs, but it is worth it to visit the largest sinkhole in the United States(just outside Fountain. We rode this again in June '09, this time camping with our pop-up trailer at "Hwy 250 Campground". 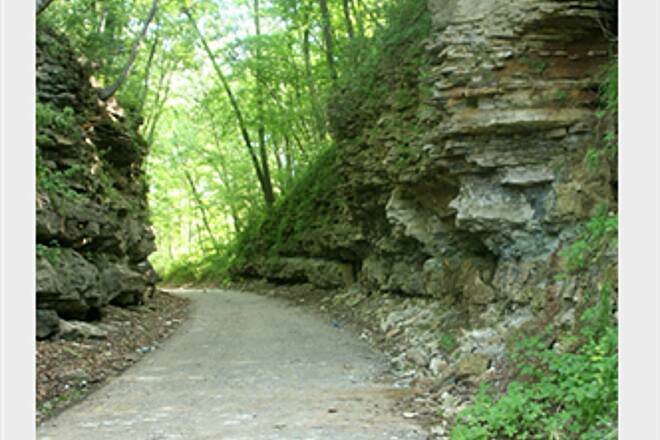 the campground is right on the trail & very close to Lanesboro, so it's very convenient. the absentee owner isn't around much & there is no office to register at. it is totally disorganized. he didn't even collect our money, so we left ours with the neighboring camper. our picnic table was very wobbly & unstable. the bathrooms are marginal but o.k. if it does get noisy or you have any other problem, I doubt whether you'll be able to get any help from mgmt. cell phones don't work well here, so good luck. next time we'll try another campground. BTW, there were NO mosquitos bothering us only noisy neighbors. Try to avoid Fri & Sat nights. As far as the trail goes, it's very scenic with it's rolling hills, bluffs, flat stretches, bridges, creeks, cute small towns, etc. There are hills on the last 6 miles of both ends; I got off easy as my wife rode only part of the trail, then became my SAG support as she checked out the antique shops & gardens. so I mostly rode the trail one-way, rather than out & back. If you get a chance, buy some bakery goods from the Amish (at farmers markets or their bakery near Preston); they are heavenly and these people are so nice & humble. I'd rather interact this way than going on an "Amish Tour". There's lots to do besides biking, too. This is one of the best trails in the state & probably the nation; highly recommended. I Rode this trail in June of 2008, and you couldn't have asked for a nicer day. This trail is asphalt with fairly flat terrain the full 42 miles, and intersects with the Harmony-Preston Trail at a point the locals call the junction. The town of Preston is approximately 5 miles from the junction where the two trails meet. If you bike to the North of the junction approximately 6 miles you'll go up a steep hill to the town of Fountain. It takes allot of leg strength to make it to the top, but you can virtually coast the whole distance back making your effort worthwhile.. The best place to stay the night would probably be a Bed & Breakfast in Lanesboro, but if your looking for something a little more economical there's the Trail End motel in Preston with it's attached snack and gift shop. 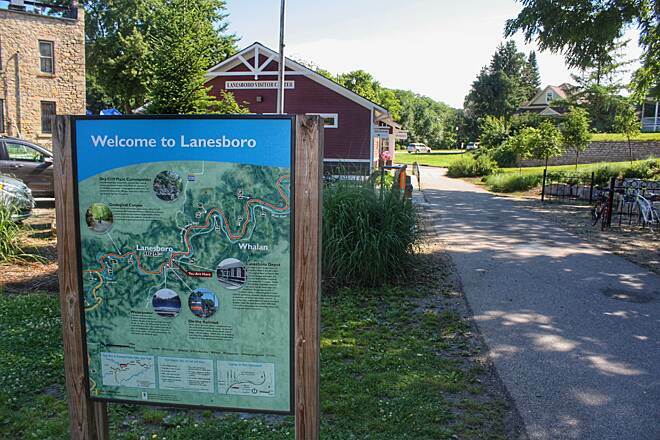 Lanesboro is a quaint historic town worth exploring, and for a quick break, stop at the Picnic Basket Sandwich Shop right next to the trail. There's a fenced in terrace with tables to enjoy your lunch outdoors on a warm sunny afternoon. Just down from the Picnic Basket is the local bike shop where you can have repairs done, or if your so inclined, you can rent the most unusual bikes there like the four wheeler with the canopy top that holds six. 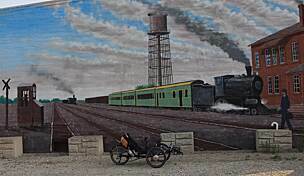 As you head south along the trail another 5 miles you'll enter the village of Whalen where stopping at the "Worlds Famous Pies" shop is a must to sample a slice from one of there homemade pies and a cold glass of lemonade, or coffee if you desire, to wash it down with. If you decided to bypass the pie shop, and are looking for an excellent eatery, you'll find Judy's Cafe in Peterson approximately 9 miles South of whalen, and a block west of the trail before you enter the downtown area. 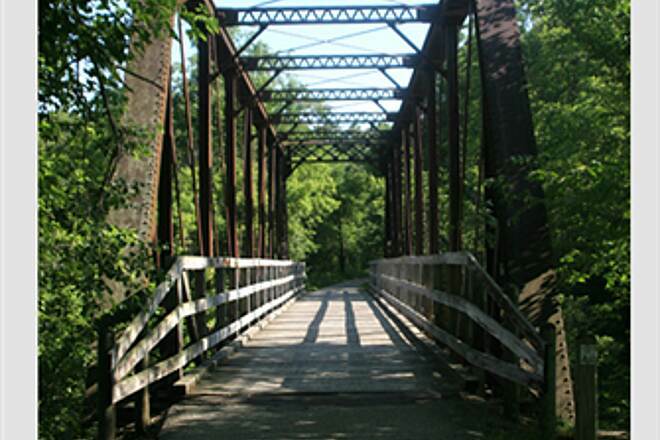 This trail has something for everyone with it's scenic views of the Root River, wooden plank bridges, Crossing an historic railroad trestle as you depart Lanesborro, and passing between the limestone bluffs on a hot day is just a little something extra to enjoy . Be careful if you decide to step off the trail to go exploring. I came across a rattlesnake sunning it's self on the edge of the trail. I found this trail to be the most scenic from the junction to Peterson. A few miles before Rushford the trail opens up into grasslands with very little shade, and to close to the highway for my taste. Intrepid bikers can ride from end-point to end-point, but that reportedly involves significant hill work. For an easier trip and the full tourist experience, rent a room in Lanesboro and ride in a different direction each day. 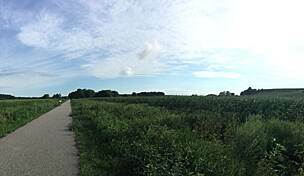 The middle parts of the trails around Lanesboro are rolling and pretty, but not terribly challenging. We rode from Lanesboro to Preston and back the first day (21 miles round trip) and the other direction the second day (no particular destination). It's a beautiful trail, paved all the way and mostly in good shape. 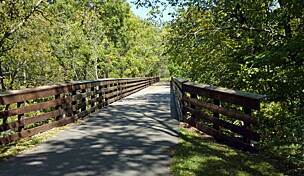 The trail is quiet, largely shaded and very attractive as it wends its way across scenic bridges and along the river. 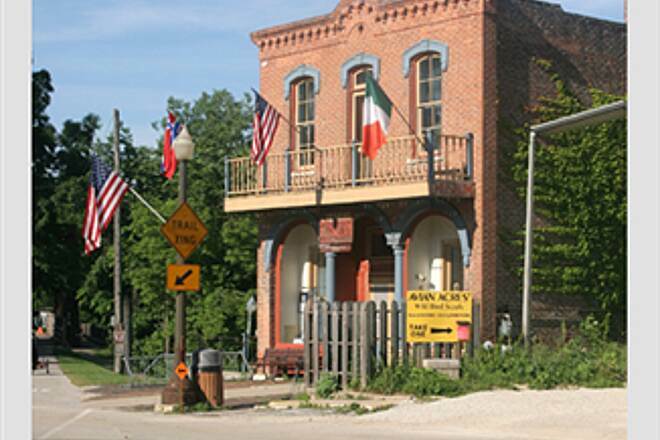 Lanesboro is a delightful town that has embraced the tourist trade while still holding on to its own small town identity. You can't throw a stone without hitting a beautiful, historic Bed and Breakfast. The main street is always hopping with restaurants, beer gardens, live music and theater even on a Sunday evening. Preston, by contrast, is pretty dull. There is just one sandwich shop (which wasn't open on a gorgeous Sunday afternoon!). However, there is a biker pit stop at the trail head with parking, rest rooms and snacks for sale. The main drawback to this trail is its popularity. Try to go on a week day during high season, especially if you hope to get a last-minute reservation in a B&B. The Lanesboro website is highly recommended; best site I've ever seen for locating available lodging.
" 26 Aug 06, after some heavy rain I was introduced to this trail. In spite of the rain the trail was excellent. 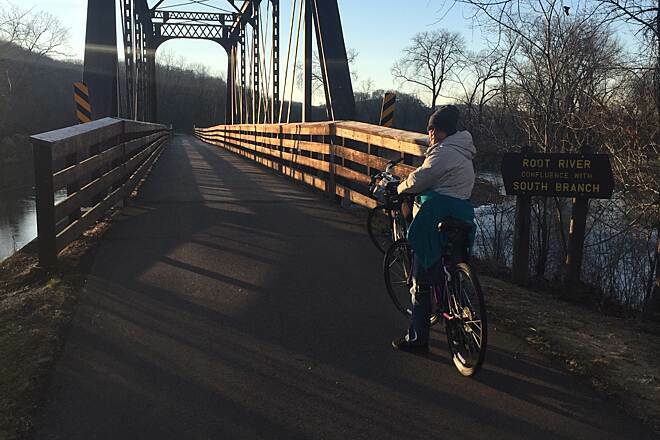 "Our neighborhood bike group spent the 4th holiday in Preston and on the trail. We had a great time and the trail was in excellent shape. We rode the trail from Preston to Whalen, Fountain and harmoney. The section to Harmony had several trees down on the trail but was still passable. Besides the trail we also enjoyed shopping in the towns. We had excellent meals in Preston and Lansboro. The biggest distraction was the highway construction around Preston." "We rode this trail again in August, with 8-year-old Nathaniel, traveling up to 52.5 miles in a day. Lance Armstrong watch out? In addition to repeating the nice section between Houston and Whalan as a one-day round trip this time, we also rode the round trip from Whalan to Fountain. 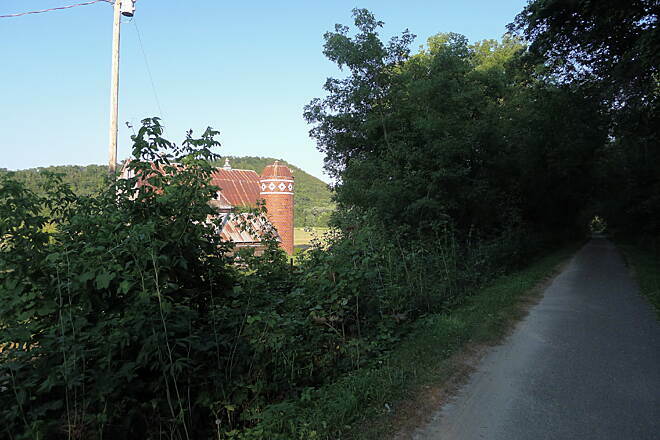 It involved a 500+ foot gradual climb (at 4% grade) that began several miles beyond Lanesboro. Most of the climb is shaded, which was very welcome. Nathaniel kept toying with us on the climb - passing us, dropping back, and passing us again. I averaged 8-9 mph while pulling 4-year-old Jennifer in the bike cart. Nathaniel had no problem passing us at 16 mph. After the climb, we were determined to find ice cream in Fountain, so we explored and found it. Go across the parking lot, cross the main road, and take the side street to the next block and turn left. Go down a few blocks and the Village Square is on your left, with nice ice cream. Also, just before Fountain are two sink holes with explanatory signs about the geology. The kids loved it. If you have time, the first few miles of the Harmony-Preston Valley Trail are very pretty, with cliffs on one side and the river on the other. Past that, it's mostly farmland, some woods, and a heck of a steep, stepwise climb - a guaranteed workout. 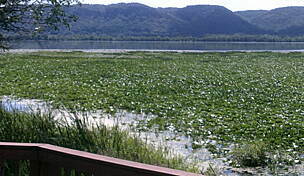 This trail has been extended 11 miles from Rushford to Houston. 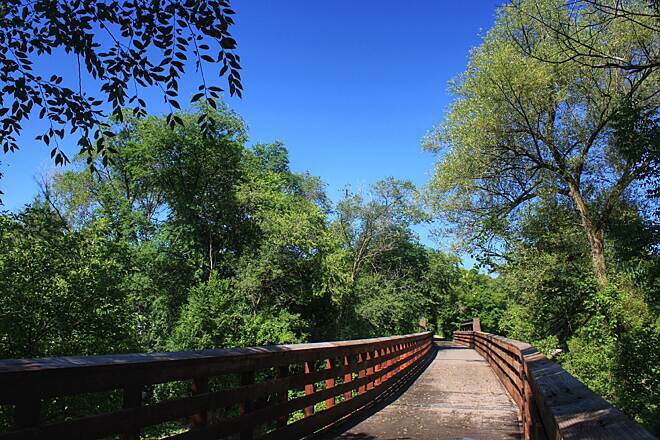 It's a gorgeous ride with a beautiful trailhead and nature center in Houston. 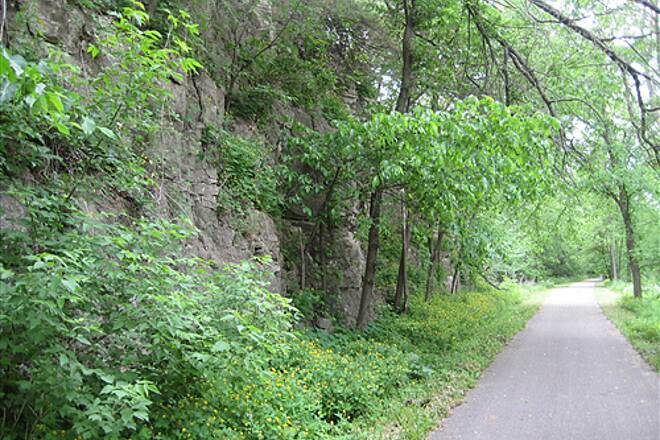 "We ride this trail often because it offers so many possibilities. It has many scenic spots, variety in terrain, and connections to other fine trails. 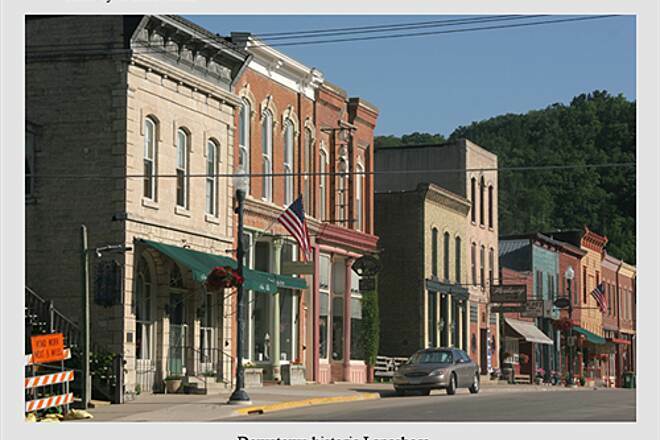 Lanesboro is a great place to base in--lots of accommodations, quaint historic sights, and good eating. 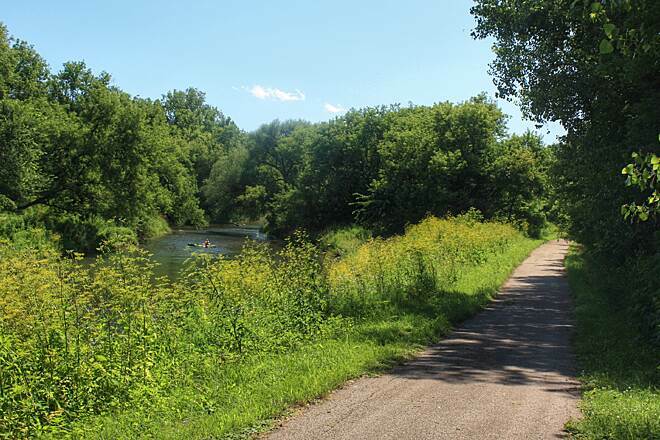 We typically spend several days biking out along this trail or its connecting links, returning to Lanesboro each night. We have also panniered the full length of the trail, but if you don't tent, this takes some planning with advanced reservations (not a lot of accommodations on the east end)." "This is a very nice trail, which we did in late August 2001. Much of the trail has shade, with only some hot stretches (most notably, the few miles east of Houston and the few miles east of Rushford). The wooded sides of the deep valley are beautiful, with some limestone cliffs. 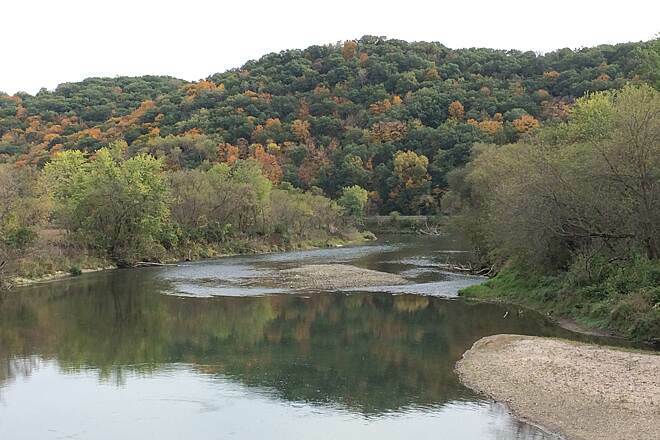 We passed through many wooded areas, and had many views of the Root River, with wooded bluffs in the background. The asphalt is in good condition, particularly the new stretch between Houston and Rushford. Road crossings are few and far between, a welcome difference from bike paths in the Chicago area. Most of the trail is away from the busy road and very peaceful. The trail was not crowded. Most of the towns along the way have great ice cream shops, with the shop by the path in Rushford giving the most generous serving size. If you have kids, a park about 1 mi. north of the path in Rushford has a nice playground. You can ride the sidewalk on the western side of busy Rt. 43 and cross when you get to the park (right across a bridge with a sidewalk only on the western side). Going from Houston to Rushford, just before the ""steep section,"" the trail appears turn right onto a road, but the ""road"" is really the bike path. On the way back, the left turn onto the path is unmarked, so keep your eyes open. Some signs both ways would help at this spot. The ""steep"" section gains about 120 ft. in about 1/4 mi. In this section we (with our 6-yr-old on his mountain bike and me pulling our 2-yr-old in a bike cart) did about 6-8 mph uphill and a fun 19-23 mph downhill. Other than this steep section and the 4% grade west of Lanesboro, the trail is mostly level, with little ups and downs. 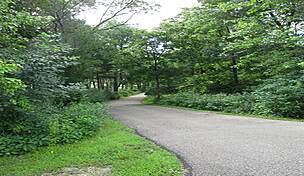 Of the campgrounds on the trail map, we saw only the one at Lanesboro, which was at a nearby city park to the south. The tent sites are by a lake, probably not good for toddlers. The others must be off-trail. We stayed at Beaver Creek Valley State Park to the south, which has nice tent-only campsites. Unbridged stream crossings may make this a problem in the spring, as the road to the campsites may not be passable. On the Root River Trail, our 6-yr-old did up to 30 mile trips in a day, averaging about 10 mph - he commonly goes that far - Lance Armstrong watch out?